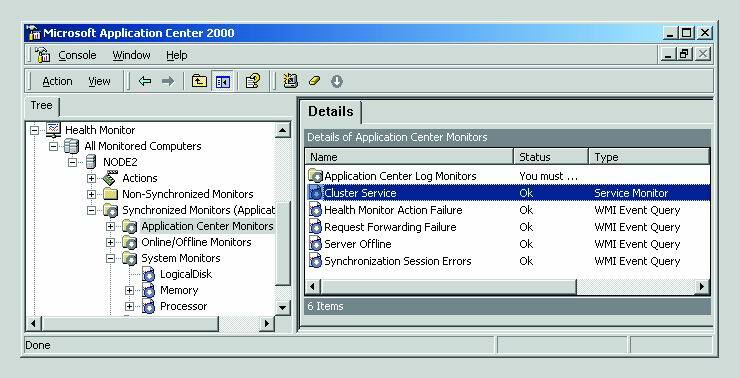 Application Center 2000 isn’t the best known of Microsoft’s .NET servers, but if you run a Web or server farm, it can be indispensable. While Microsoft has had nothing but great things to say about Application Center 2000, I’ve been hard-pressed to find many engineers who have even heard of it. Microsoft has had such faith in the inevitable rise of this product that it’s released two exams (70-226 and 70-232) on the design and administration of Application Center 2000 in support of Windows 2000 technologies. Is this merely eye candy for the certification junkie? Absolutely not. Application Center is the real deal and should be seriously considered in most enterprise-level Web farm and multi-node application cluster environments. Is Application Center 2000 Right for Me? If you’re managing network load-balanced Web server clusters, odds are you already know of the management headaches associated with maintaining consistency between all applications running on each individual node. Also, I’m sure you’re aware of the difficulty of managing and monitoring each individual server in a cluster. For small-scale clusters, this isn’t a big deal. If that’s where your thinking is, then application deployment isn’t the reason you need Application Center, but there may be others. Event Monitoring. Consolidates events on all nodes and presents them as a single event log. Health Monitoring. Simultaneously monitors the status of services, processes, and performance monitor counters for both server and BackOffice applications. Application Deployment. Cluster replication can be configured as automatic or on-demand, allowing administrators to automate application rollout and updates on cluster nodes. Node Management. Changes to one server in the cluster can automatically be applied to other servers. Failover for COM+ Components. The only supported method for clustering COM+ components is through the use of Application Center. The need for hosting and managing distributed applications will be unavoidable in the evolving .NET framework, and at the heart of that framework will be Application Center. The following screenshots give just a few examples of what Application Center can do. 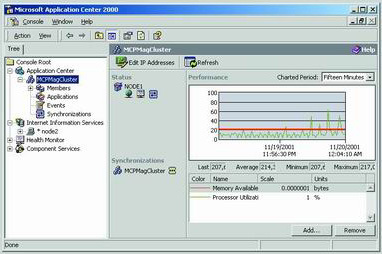 In Figure 1, Health Monitor, a tool bundled with Application Center, is used to check the service status of a cluster node. 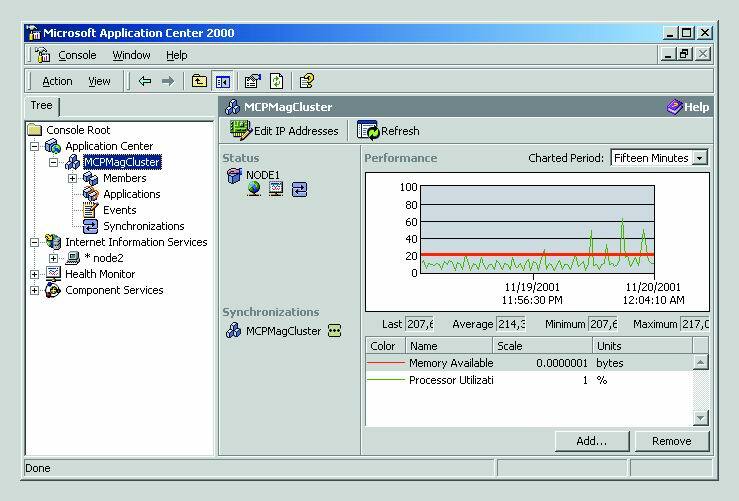 In Figure 2, Performance Monitor is run through Application Center to provide a snapshot of cluster performance. These illustrations should, at the very least, whet your appetite for additional Application Center knowledge. Single console management and monitoring is crucial to the success of the .NET initiative, and Application Center is that single console. Microsoft is hailing Application Center 2000 as the glue that will hold together its expanding .NET framework, and it delivers on that promise. With the ability to monitor and manage resources on other .NET enterprise servers such as ISA Server, Commerce Server, BizTalk Server and SQL Server, Application Center 2000 is the answer for managing diverse servers in a .NETworked universe.